EX Raijinken is a single hit attack. On a hit, the opponent will be stuck in the air afterwards for a limited time. They can be attacked with another move, or even get pushed by running to the edge of the screen. EX Air Raijinken lasts for a longer time. The timing in between the hits are longer than the arcade version. It now sort of works as a special that can be “placed” on the screen. EX Collider hits less times. That means less scaling for the combo to come afterwards. Neomax comes out faster, MAX cancel’s timing is different. Invincibility runs out before the hit detection comes out. Fierce/EX Super Lightning Kick does more damage. On a full hit, the fierce version’s damage has been raised from 70>100, EX from 135>192. Collider has faster recovery on whiff, can rarely be punished if blocked from a fierce punch. Producer Yamamoto says: "We’ve balanced him so that even the attacks that weren’t being used in the arcades would be of use. The EX Collider and EX Raijinken should especially come to more use since the opponent can be hit afterwards. The EX air Raijinken should be fun to place around for an attack string. His Neomax has no invincibility but it comes out a lot faster, so it might be fun to think of ways in using it." Benimaru has always excelled at mid-range and close quarters combat in previous KOF games, and he is even stronger in KOFXIII. His ground game is exceptionally good with his good standing and crouching normals, and he can control and maintain space in the air with his aerial Raijinken's, his annoying jump D and air throw. His command throw the Benimaru Collider (hcb,f+P) can create some very nasty okizeme (wake-up) mix-ups, and his normal throw in the corner can be juggled after to inflict major damage. Benimaru's long range capabilities are a little weak, but he can threaten projectiles with his EX Benimaru Lancer (qcb+AC) and his NeoMax (qcfx2+BD). His meter and drive usage is very economical and dish out heavy damage in many of his combos, especially in the corner. The only disadvantages he has is that his damage placed mid-screen (especially without meter) is rather weak and many of his more damaging combos can be a bit tricky to execute. He also has very short hit-confirms strings which may cause the player to sometimes end the strings if blocked to in an unsafe position or to miss an opportunity on big damage if a hit was placed and the player wasn't ready for it. Overall, Benimaru is a very well rounded character that can fit in almost any team position, and is great for beginners learning the game, and as well for seasoned veterans who are interested in mastering his more difficult combos. s.A: 25 damage, cancel-able, hits mid. A short ranged but swift jab that is safe on block by +3 frames. It can be good to use against opponents who are trying to hop at you at point blank range. This punch whiffs completely on crouching opponents. s.B 30 damage, cancel-able, hits mid. This kick is a great poke for stopping incoming hops, much better than s.A. It's very quick and covers a good distance in front of Benimaru. 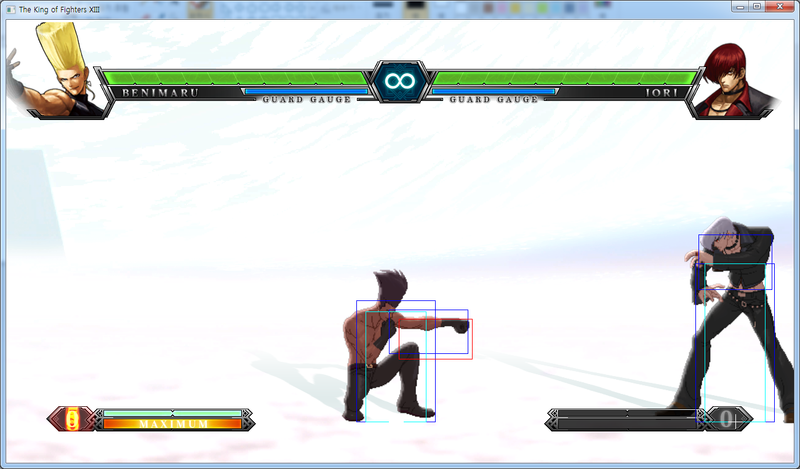 It's safe on block by +3 frames, but it is open to quick sweeps and crouching B's if whiffed at a certain distance. s.C 80 damage, hits mid. Decent ranged horizontal punch that isn't cancel-able. Gives Benimaru a fair amount of push-back. Good for mid to close range zoning but isn't good for stopping hops. Stick to st.B for that. s.D 2 80 damage, hits mid. A jumping round kick aimed at the opponent's mid-section. 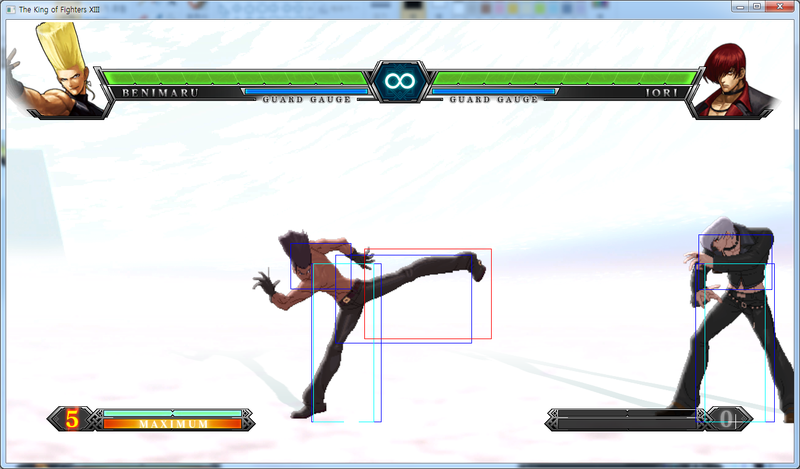 Next to st.B as one of Benimaru's best standing normals. It covers a great range, has good push back, and it is also very safe on block by -2 frames. It has lower body invincibility and also moves him forward a bit. It isn't cancel-able but if you can bait movement and reversals on block with this kick for some nasty frame traps. cl. C 70 damage, cancel-able, hits mid. Benimaru delivers a quick elbow hook. The activation for this move is pretty far, and it comes out rather fast as well. It has a good amount of push-back for the negative frames on block it has (around -4). cl. D 70 damage, cancel-able, hits mid. A high knee aimed at the opponent's chest. This move has the same start-up as cl.C, and is one less frame on block (overall -3). The push-back on block is around the same distance as well. Don't hesitate to use it if you are close enough to the opponent to confirm into a combo, but be careful on block while they may Guard Cancel Roll it. cr. A 25 damage, cancel-able, hits mid. A short ranged jab that is 3+ frames on block. Not an extremely important crouching normal but it can come in handy offensively against blocking opponents because of the light amount of frame advantage. It can sometimes miss if you are trying to combo a cr.B from it depending on how close you are to the opponent. cr. B 30 damage, cancel-able, hits low. The typical low light kick. Good range and speed. You will be using this lot in many of his bnb and HD combo variations. Use it. cr. C 2 70 damage, cancel-able, hits mid. A crouching hook. Good for anti-airing hops or jumps but it might trade if performed too late. 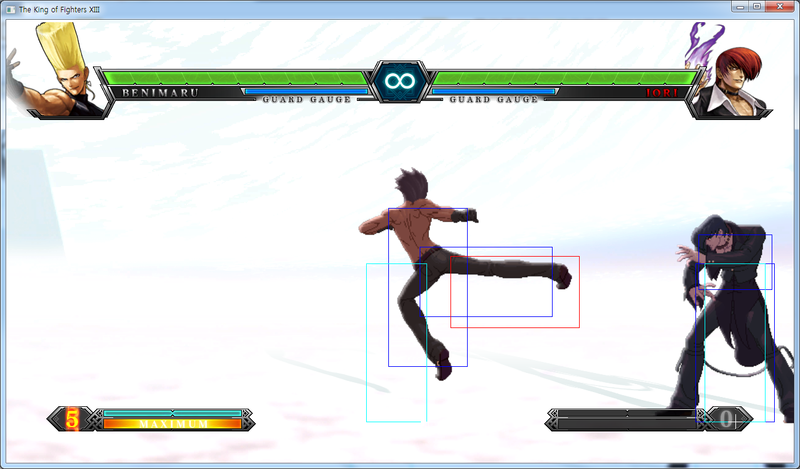 His hurtbox seems to shrink a bit while it is in activation. cr. D 80 damage, cancel-able, hits low. A short ranged sweeping round kick. Use this sparingly because of its recovery. You can whiff cancel it into any of his special moves just in-case if it is out of range. hop A j. A 45 (40) damage, cancel-able, hits overhead. A down angled elbow which has very short range. Can be used as a close ranged air-to-air or air-to-ground attack to beat out jumps from the opponent in advance, plus it's cancel-able too either by Benimaru's qcf+A & drill (down+heavy kick) which are both fairly safe on block. hop B j. B 45 (40) damage, cancel-able, hits overhead. Benimaru thrusts his knees slightly in the air. It lacks range but has fair cross-up ability. hop C j. C 72 (70) damage, cancel-able, hits overhead. A jumping hook punch. Sort of lost it's crazy cross-up flair from past KOF games, but it's still there. The range is a little short of this one as well. You will probably see this attack used next to his j.D sometimes by some players aiming to air throw them. hop Dj. D 70 (68) damage, hits overhead. Benimaru's best normal, period. All-purpose almost. Good air-to-air, good crossing up, jumping in, good for zoning, good jumping anti-air, etc. And most of all, its almost impossible to anti-air him on the way down with a character's crouch B because the hitbox is so large. Use it and abuse it. CD 75 damage, cancel-able, hits mid. A side kick that aims at the opponents mid-section. Has a good horizontal range, and it is cancel-able to interrupt its recovery, both on whiff and during contact. Good for staggers for corner pressure, but keep in mind that Benimaru doesn't step or move forward during the start-up frames. GCCD 10 damage, hits mid. Catch and Shoot = (b/f+C/D) close 100 damage, can be broken, and can be ground teched. 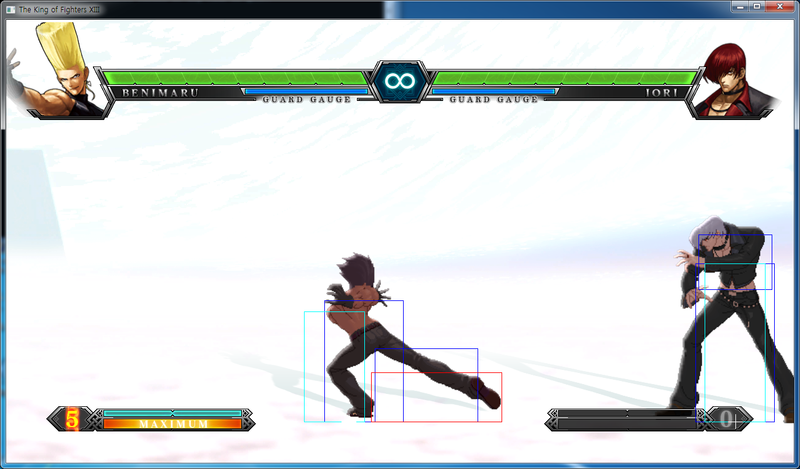 This throw when not ground teched midscreen can provide Benimaru with a good amount of okizeme options (crossup j.D, empty jump throw, etc.) but most of the time it will always be teched, taking away those options. 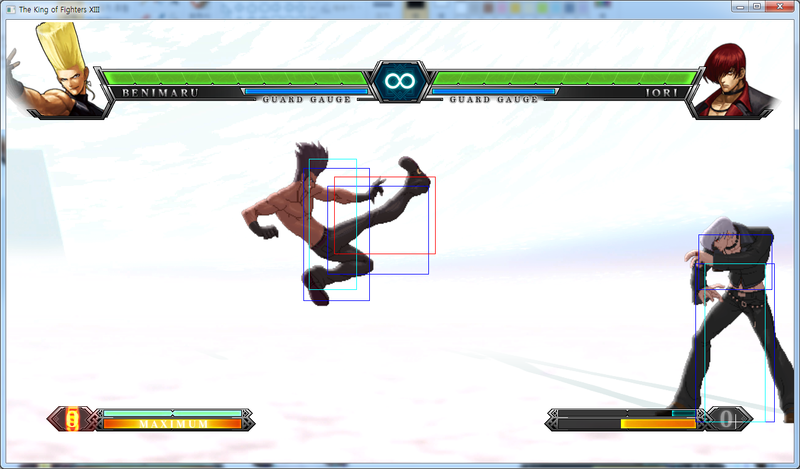 This throw is best in the corner while Benimaru gains the ability to combo the opponent while they are falling. Be sure to learn his throw corner specific combos to add the maximize the damage you gain from the throw. Spinning Knee Drop = (b/d/f+C) in air 125 damage, cannot be broken, causes a hard knockdown. An extremely useful air throw that you can option select by pressing towards and j.C. If you see in match videos someone spamming his j.C, that player is most likely fishing to air throw him. Thank goodness that the opponent lands on the same side after the throw connects (unlike Yuri's), but the opponent wakes up at the same time when Benimaru lands from connecting the throw. 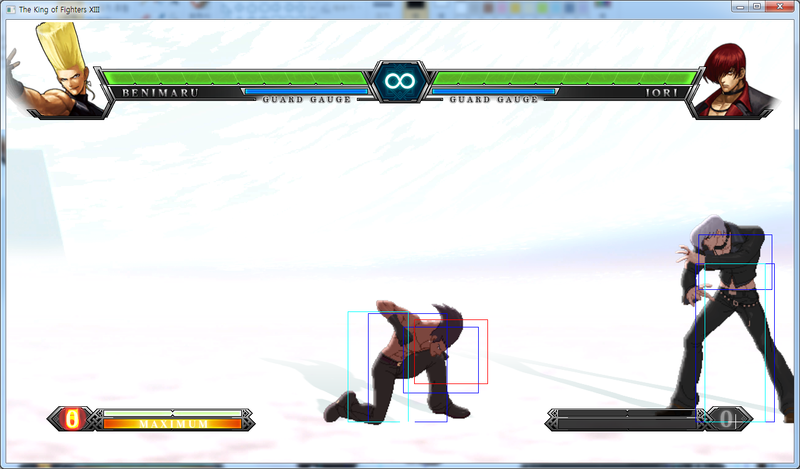 This throw is also useful in a couple of his corner combos which adds an extra 100 damage. Jackknife Kick = (f+B) 2 65 damage, cance-lable, hits mid. Benimaru steps forward and performs a slow kick that looks like he's kicking a soccer ball into a goal. 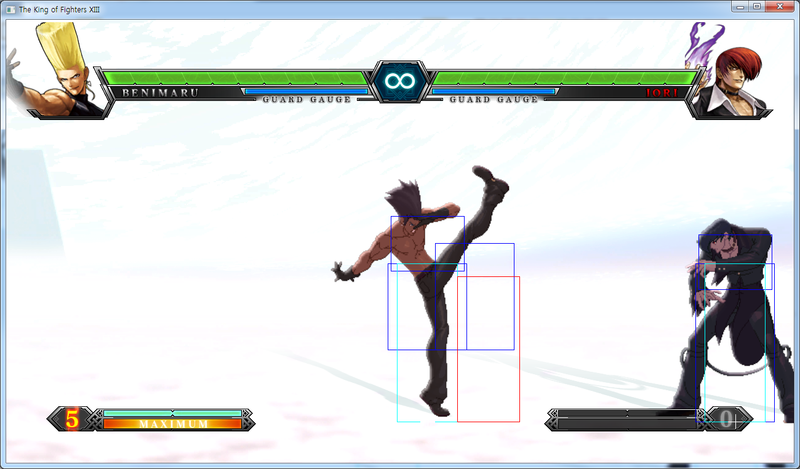 You cannot cancel this kick from any of his normals but you can out of it with any of his special and super moves. The start-up is a bit on the sluggish side, and the fact that you cannot cancel into it from any of his normals makes this kick a little less useful as it was in past KOF games. It isn't safe on block either but it does have a bit of pushback too but not much. Flying Drill (d+D) in air 25+23+22 damage, hits mid. Benimaru does his signature Dhalsim like diagonal drill kick, which may active on accident if you're pressing down briefly while your doing a j.D. 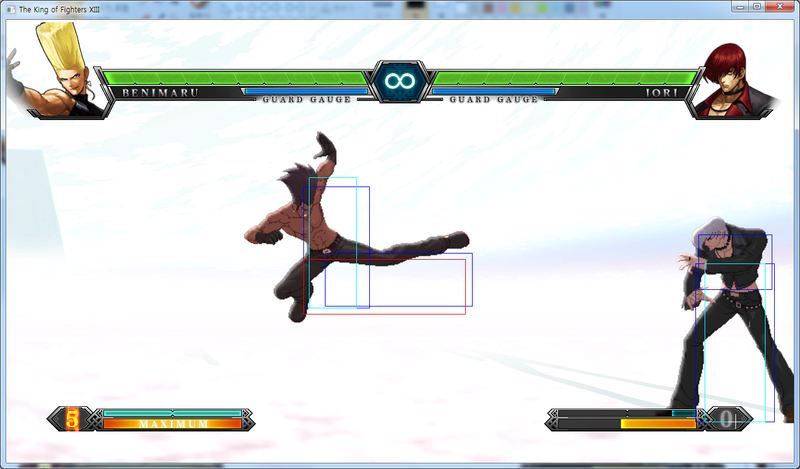 The hitbox seems smaller compared to past KOF games which lesses its priority. You can combo after the last hit connects into a few of his special moves, which doesn't require strict timing at all. The small pause Benimaru initiates before he drills down can be used in some fireball zoning situations where you will need the projectile to zoom past you. It's a good move to use but keep in mind that its priority isn't very strong. It's best to use it as a pressure tool since it's frame advantageous. Raijinken = (qcf+P) Benimaru's electric fist ball. The A version just stuns them while they are still standing, while the C version knocks them down. The A version has slow start-up but is safer on block, while the C version starts up faster but is less safe. The A version can only be comboed after heavy attacks, while the C version can be comboed after light and heavy attacks. The hitbox covers a good amount of space around the electric ball and stays out for a decent amount of time, which can be good for stopping opponents from jumping of the corner, preemptive anti-airing purposes and quick frame traps for stinging opponents trying to move or press buttons hastily while on the defense. You can negate fireballs with any of the punch strengths as well. Raijinken Air = (qcf+P in air) This electric fist ball points downward diagonally. The A version moves Benimaru slightly forward, while the C version moves him back a bit. The A version has slower start-up than the C version. Both of the punch strengths leave the opponent stunned briefly while standing. Similar to the ground Raijinken, the hitboxes cover a nice amount of space, which should be good for aerial zoning, but keep in mind that the start-up isn't extremely fast at all, so it's best to use them preemptively. You are also vulnerable while you are landing if you perform this move high in the air. (EX) = qcf+AC in air The electric ball that Benimaru summons in the air actually stays active on the screen for a while which can shock and stun any opponents who are hit by it. When Benimaru lands he can move around and briefly follow up any attacks to either add hits, add guard damage to blocking opponents, command throw them or even try to cross them up. Benimaru Lancer = (qcb+P) Benimaru flashes a vertical lightning strike that surrounds his body. Both of the punch buttons have the same technical qualities. The start-up is very slow, the hitbox is very skinny, and it doesn't have any kind of invincibility at all, which makes it a bad anti-air option. Outside of using this move during his HD combos and Drive Cancel combos, alone, this move doesn't have many practical uses. You are better off using his dp+K as anti-air which has almost the same vertical range with slightly wider horizontal range. (EX)= qcb+AC This time the lightning strike teleports slowly and hits to where ever the opponent is on the screen. The start-up is pretty slow (and Benimaru is not invincible) so the opponent can properly react by rolling or attacking Benimaru with a move with fast start-up. But if the opponent is throwing a fireball, jumping or initiating some kind of attack where the start-up is slow, they will be hit if the timing is correct. Also, the opponent will be flown backwards in the air which they are in a juggle-able state. Super Inazuma Kick = (dp+K) Benimaru's lightning flash kick. The B version makes him flip and land a few spaces backward, while the D version has him flip and land stationary. Even though both of the kicks are at negative frames on block, the B version gives him a bit more recovery because of the space away where he lands. Both versions can be combed from light and heavy attacks. This flash kick is good for anti-air mid-range jumps and super jumps because of its wide, vertical hitbox. The B version doesn't have any invincibility during its start-up, while the D version does have a few frames of invincibility. It's a good to use a reversal but risky as well because of the bad recovery on whiff and on block. 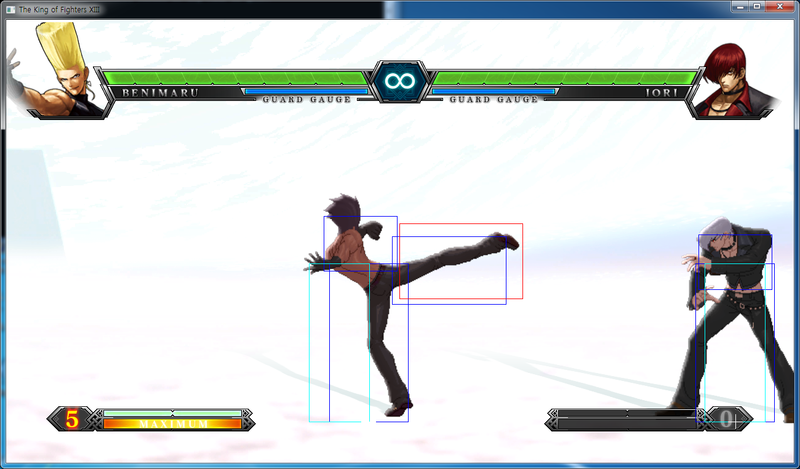 (EX) = dp+BD This version of his flash kick has invincibility at the start, and hits 3 times. The recovery on block and on whiff is still pretty bad, so be careful. Iaido Kick = (qcf+K) An extremely fast front kick. Both kick versions have the same damage output, while the D version has faster start-up. Even though unsafe on block, he gains a small amount of pushback away from the opponent, but certain moves can punish it. This move will be used a lot in many of his bnb combos, Drive Cancel combos and HD combos. (EX) = qcf+BD Even though you may not see this EX move very often, it does have a 2 frame start-up which can be good for punishing moves with tight recovery times. ∟ d, u + B/D = Handou Sandan Geri His signature 2 hit follow-up returns. You can perform this move a bit late after the qcf+K connects. The first hit of the follow-up (2nd hit after the qcf+K) is drive cancel-able, while the last hit give the opponent a soft knockdown. On block, this follow up isn't very safe at all, so be sure to properly confirm into the qcf+K first. The input of d,u + K must be performed cleanly or else a dp+K might come out. This move is important to learn because it is used in many of his combos. Benimaru Collider = (hcb f+P) close This instant command throw cause the opponent to drop to their knees and fall causing a hard knockdown. The player is able to move while the opponent is in the falling animation, which can setup some really nasty wake-up options. This throw can be comboed from both light and heavy attacks. (EX) = hcb f+AC close Even though it outputs less damage than the normal version, Benimaru is able to follow up and hit the opponent while they are falling. The following hit must be quick or else the attack will miss while they are completing the fall. Raikouken = (qcfx2+P) A much larger and intense version of his Raijiken lightning fist ball. The start up is rather slow, and it isn't safe on block at all. 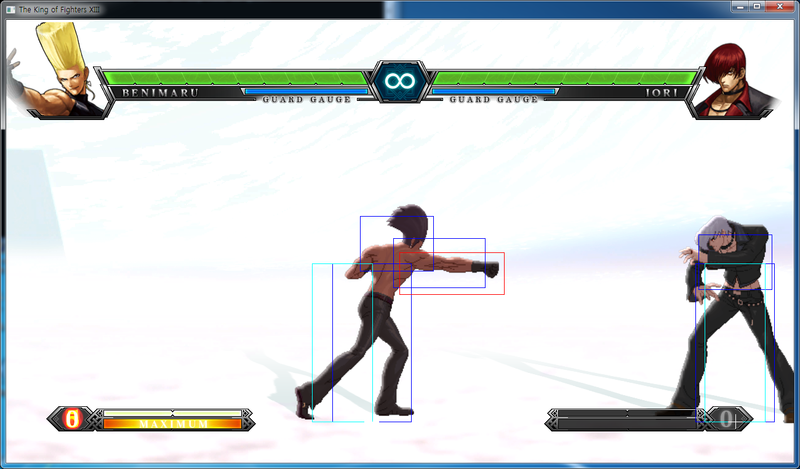 The push-back on block mid-screen is minimal, and it is nonexistent when performed on a cornered opponent. It's probably best to use the stock for one of his EX moves or save it for his much better EX version of this super. (EX) = qcfx2+AC An EXTREMELY fast and damaging lightning ball. The hitbox covers the same amount of space as the normal Raikouken, but it's very fast start-up make it very useful for catching any kind of jumpins (hops and normal jumps). You can combo it from light and heavy attacks which makes it more threatening especially if you do not have any Drive Gauges available. On block it has the same qualities has the normal version of this super (which is unsafe), so it is best to use this if you know for sure it will combo or hit. Overall, its best to use this super over the normal version because it is so fast and damaging which can help punish opponents laggy moves, and as a reaction anti-air if they are in very close range. Rolling Thunder = (qcbx2+P) A globe of lightning quickly bursts and surrounds Benimaru briefly. 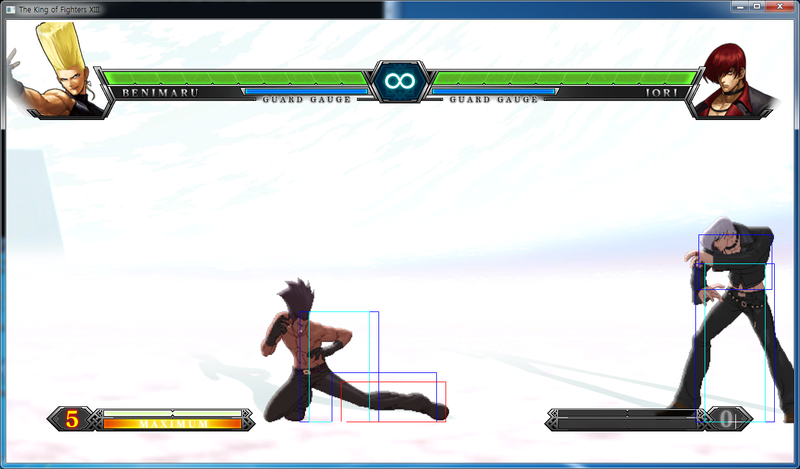 The start-up is the same as his EX Raikouken (qcfx2+AC), while its recovery is far worst. There is not any push-back on block, so the opponent can freely punish him while he is recovery. 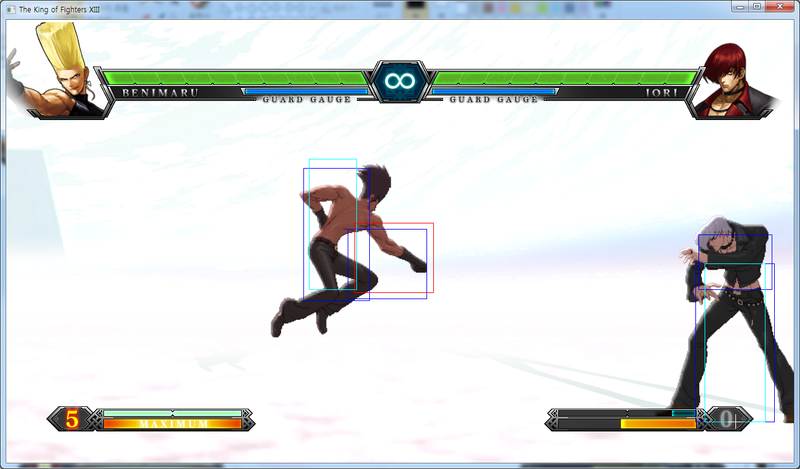 It's best to use this move as a anti-air because of its fast start-up and large range that surrounds him. A much better super than his normal qcfx2+P Raikouken because of its more useful anti-air option. 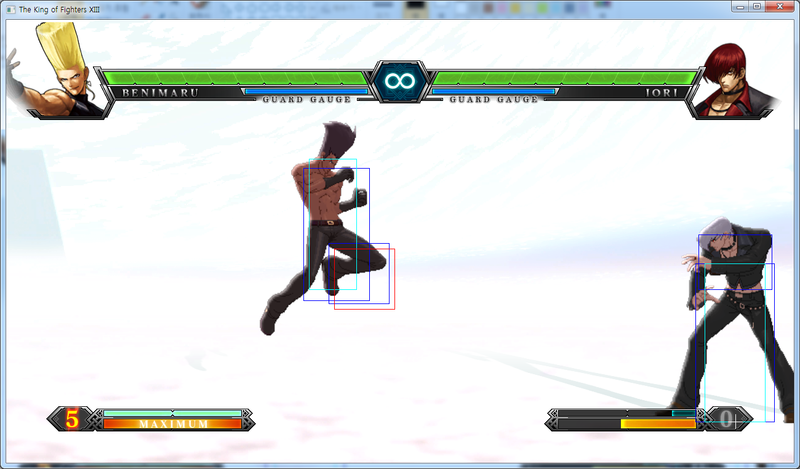 This move may misfire if you are buffering a qcb+AC, so be careful. Raiouken = (qcfx2+BD) (can be directed uf/df/f after activation) Benimaru zaps the opponent with a very large and fast snake like looking lightning strike which can be directed. The strike starts above his head (which can hit opponents jumping over him) and shoots out in-front of him. Very useful to connect after a EX qcb+K (which juggles them) or to anti-air full screen superjumps, to punish moves with bad recovery, to punish and go through projectiles, or even to chip out opponents on block who have under 100 life points left. Keep in mind that Benimaru is not invincible during the start-up of this move. When the lightning is directed up-forward (at full screen), it will miss standing and crouching opponents, and if directed down-forward, it wont miss them at all. If blocked, the opponent gets pushed back VERY far, which makes it hard to punish. This move has a couple of places in a few of his HD combos, and you can use this move defensively as well. cr.Bx2 => A two-hit low starter. Since crouching B is special cancel-able, you will be using this a lot and you will see this a lot in many of Benimaru's bread-n-butter combos. It can be somewhat difficult to fully hit-confirm because of the spare amount of hits, but with practice and good reactions it will become very natural. This two hit string is safe on block and a standing B can be added to create push-back. cr.Bx2, st.B => 2 low hits then a mid. 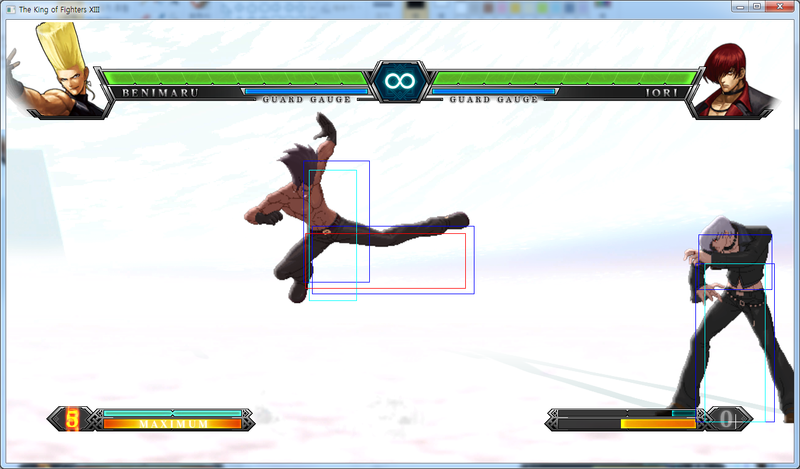 This is essential for starting his HD combos. But you will need to late cancel the activation for a st.C to release for you can continue the rest of your combo. st.C or st.D => A single hit mid attack. It has more damage than using 2 crouching light kicks (B) but it is a single hit confirm. Somewhat difficult to confirm into on a standing/crouching opponent consistently. After a jump attack it is best to confirm into either standing C or D then into HD or as special move for more damage and to lengthen the hits from 1 to 2. 1.) st. A > cl. C (L) - 2 frame gap between st. A and cl. C. St. A whiffs on crouching opponents, except on Raiden and Maxima when they are in guard position. 2.) st. A > far C - 3 frame gap between st. A and far C. St A whiffs on crouching opponents, except on Raiden and Maxima when they are in guard position. 3.) st. A > cl. D (L) - 2 frame gap between st. A and cl. D. St. A whiffs on crouching opponents, except on Raiden and Maxima when they are in guard position. 4.) st. A > cr. C - 4 frame gap between st. A and cr. C. St. A whiffs on crouching opponents, except on Raiden and Maxima when they are in guard position. 5.) st. A > cr. D - 3 frame gap between st. A and cl. C. St. A whiffs on crouching opponents, except on Raiden and Maxima when they are in guard position. 7.) cr. A > far C - 3 frame gap between cr. A and far C. 8.) cr. A > cr. C - 4 frame gap between cr. A and cr. C. 9.) cr. A > cl. D (L) - 2 frame gap between cr. A and cl. D. 10.) cr. A > cr. D - 3 frame gap between cr. A and cr. D. 11.) cr. B > cl. C - 4 frame gap between cr. B and cl. C. 12.) cr. B > cl. D - 4 frame gap between st. A and cl. D.
Not much he can do without meter except zone with air Raijinkens (j.qcf+P) to stop incoming aerial advances. Stop super jumping opponents with a preemptive ground Raijinkin, or a Super Inazuma Kick (dp+K). Using a neutral jump D can also stop opponents that are jumping or super jumping towards you. Take advantage of its long horizontal range. 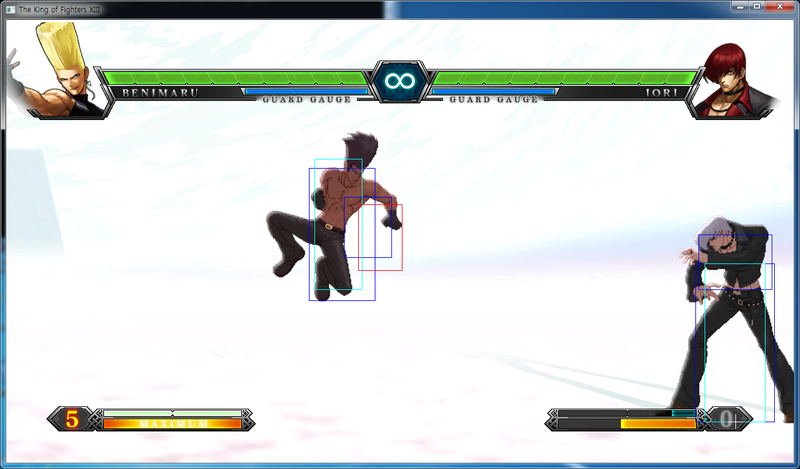 His air and ground Raijinkin (qcf+P) can negate normal projectiles. His EX Benimaru Collider (qcb+AC) used preemptively can zap opponents while they are throwing projectiles and even while they are jumping if timed correctly. 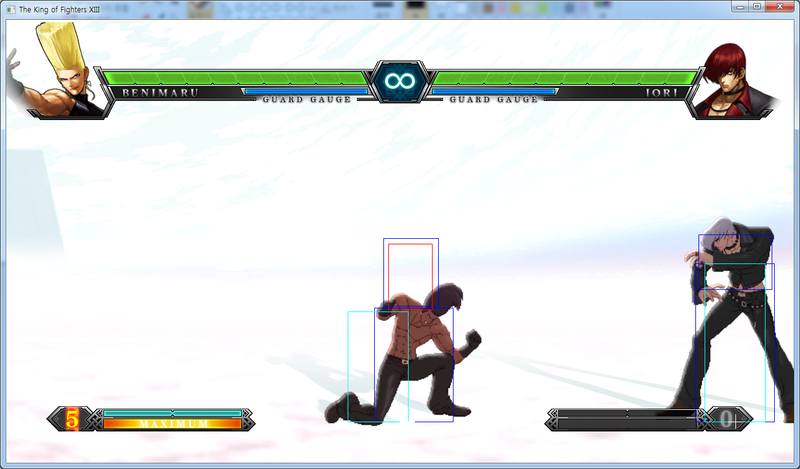 His NeoMax (qcfx2+BD) can override projectiles and hit the opponent at the same time. 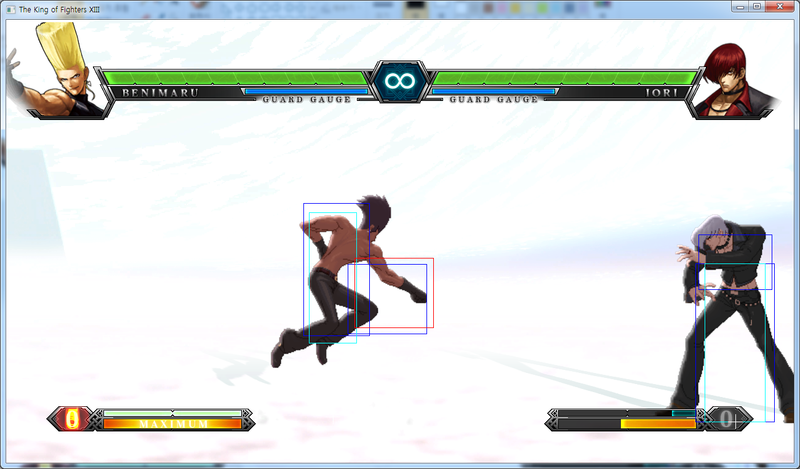 It can also be used as an anti-air option full screen. If you hit the opponent with his EX Benimaru Collider, you can hit them in the air with his NeoMax without a counter hit. Keep opponents out by zoning with st. B for hop and hyper hops, along with st. C at more closer distances. Use his st. D when you get much closer then try to read what the opponents does after they are either hit by it or when they block it. If you have good reflexes, use dp+D to sting regular and full jumps. If you are not confident in using his dp+D, try using his cr. C which has a rather low profile and is a good grounded anti-air. Use the range and priority of his j. D while hopping to keep opponents from jumping towards you in advance. If the opponent respects your j. D too much, empty hop and perform his hcb~f+P command throw. 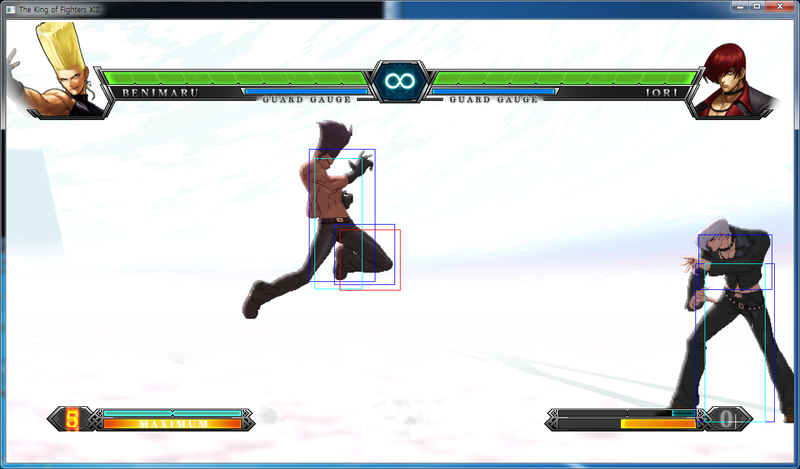 Benimaru's qcf+C can also be used to tag jumping opponents because of it's large hitbox. But it should be used rather preemptively since it's start-up isn't very fast. Once you have over 2 stocks punish any jump movement towards you with his qcfx2+AC super. It has extremely fast start-up which will catch any opponents jumping towards you at a mid to close range. Pressure the opponent with cr. B's, cr. A's, st. C's and cl. D's to confirm into qcf+K or qcf+P. Try not to do qcf+K on block because it is unsafe. 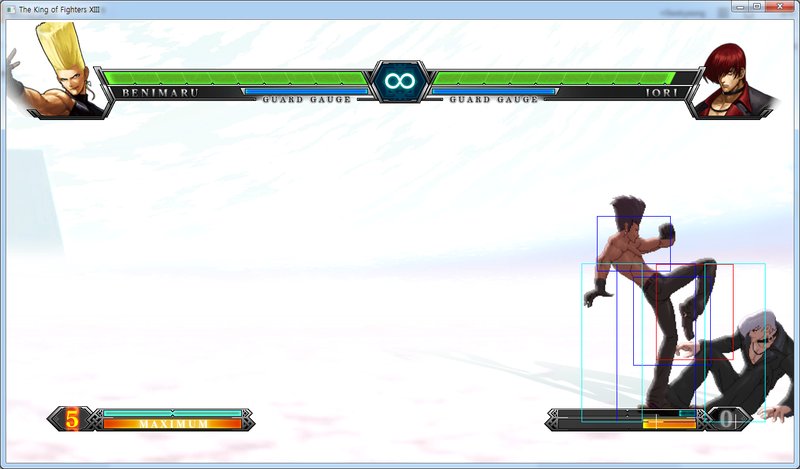 Use his hcb~f+P command throw if the opponent is blocking too much. If the opponent respects your low attacks too much, hop over them and cross them up with j.D. Combine low attack pressure with neutral hop pressure to evoke the fear of getting command thrown or normal thrown. Tag any opponents trying to jump out the corner with a pre-emptive qcf+P or a dp+D, or jump with them early on to air throw them. Catch opponents trying to roll out of the corner with a command throw or normal throw. Use extreme caution when in the corner. Try your best to shimmy your way out by walking out while defending yourself with st. B. Hit opponents trying to jump towards you with qcbx2+P or qcfx2+AC when you have meter. Benimaru is extremely flexible in any position the player places him in. At the starting position he can build meter adequately (not as much as Andy or Kyo) while at the same time not being required to use any of his meter immediately. Instead, the player can utilize frame traps, with constant pressure and mix-ups using his command throw and normal throw. His aerial options are quite annoying especially since he can brake his full and normal jumps with an air qcf+P or his Flying Drill (down+heavy kick in the air) and can cross-up opponents easily with his j.D (heavy kick). In the second and third positions when Benimaru has more meter, his damage and offensive options are increased; especially in the corner. In the corner he can use his super meter and drive cancels for rather long corner juggles either off a stray standing heavy attack or crouching light kick or from his normal throw. Mid-screen he can anti-air opponents with his fast start-up qcbx2+P super or his qcfx2+AC super or full screen against projectiles with his NeoMax (qcfx2+BD). He can also extend his combos midscreen by ending his qcf+K~down, up+K with his command throw (hcb,f+P) for an easy hard knockdown. His easy HD combos mid-screen can deal anywhere up to 500 to 700+ damage with 2 or 3 bars while his HD combos in the corner can deal a bit more damage with less meters. All of these possibilites mixed in with his already strong corner pressure can make Benimaru very threatening when placed in a 2nd or last position on a team. Ash's blockstring of cr.Bx2, back+B can be punished with an EX qcf+K. Use Benimaru's hcb,f+P or hcb,f+AC against Ash's charge b~f+AC attack on block. Use Benimaru's hcb,f+P against Athena's light kick Phoenix Arrow (air qcb+B). 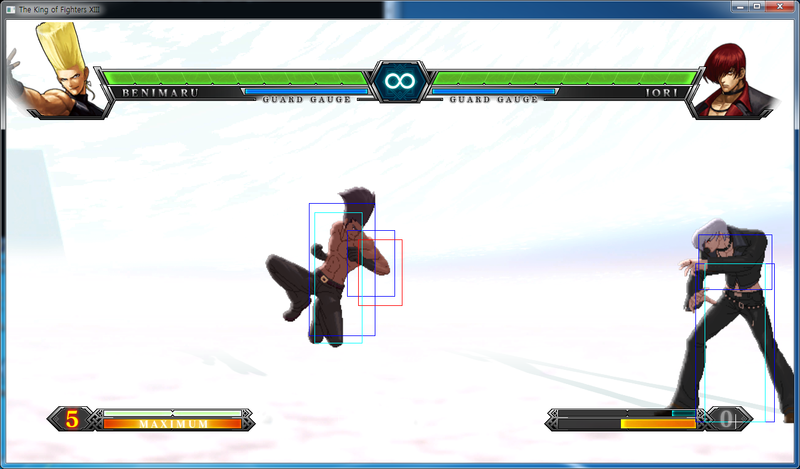 Without any normals placed beforehand, Benimaru's qcf+K can be punished by his own qcf+K. Use qcf+A/C or qcf+K against a player who uses Billy's j.C frequently. 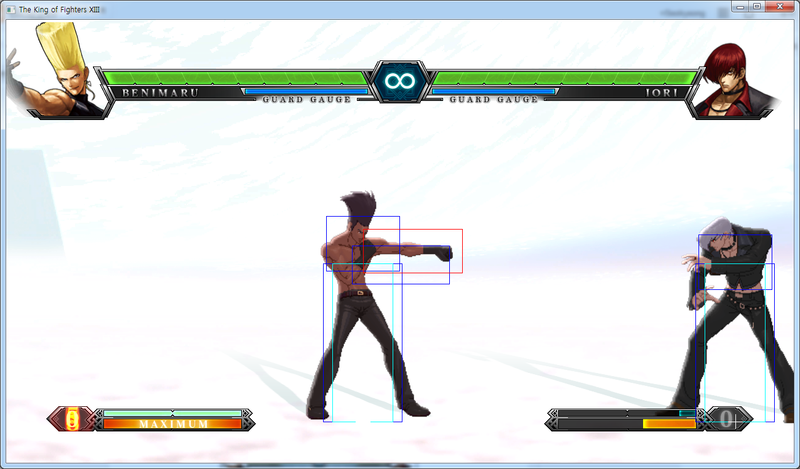 Benimaru's qcf+P or qcf+K will hit Billy's because there is a hurtbox placed on his stick. The common blockstring of (beginning with s.C, f+A or cr.Ax3 etc.) qcf+Px2 rekkas, qcf+B teleport can be punished with a Benimaru Collider (hcb,f+P) performed very quickly in the opposite direction while Dou Lon teleports. If the Dou Lon player does not teleport, he will get hit by a s.C.
Dou Lon's f+B can be avoided by Benimaru's stand D.
Elisabeth's dp+AC can be punished with Benimaru's qcf+K and his qcfx2+AC. 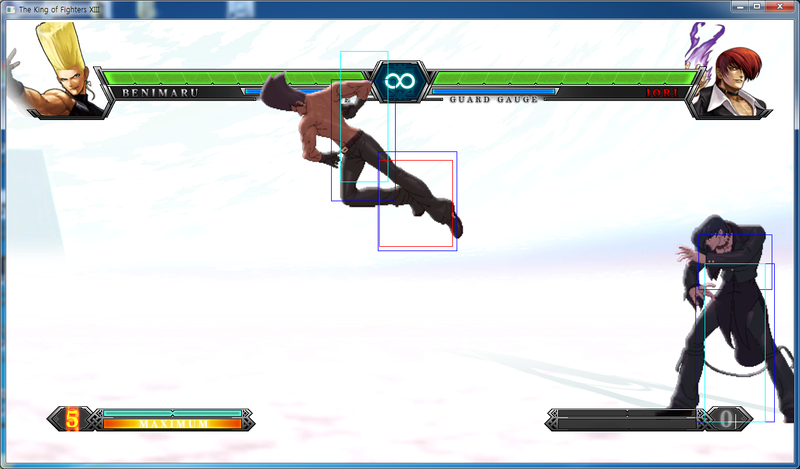 You can punish Hwa Jai's blockstring of st.A, df+B with EX qcf+K or EX dp+K. Be careful of the distance from push-block though. If someone is using the blockstring repeatedly, just use qcf+K to hit them before they place another jab. Kim's qcb+K (both light and heavy kick versions) can be punished by Benimaru's qcf+K. Kim's qcb+B can be punished after a blocked st.CD or crouching D regardless of pushback. 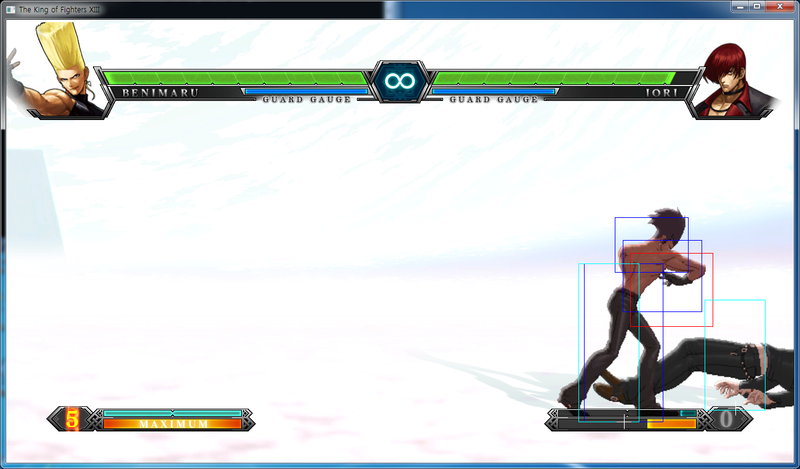 In between Kyo's qcf+K kicks, you can dp+D, qcfx2+AC, and qcbx2+P for a counter hit. 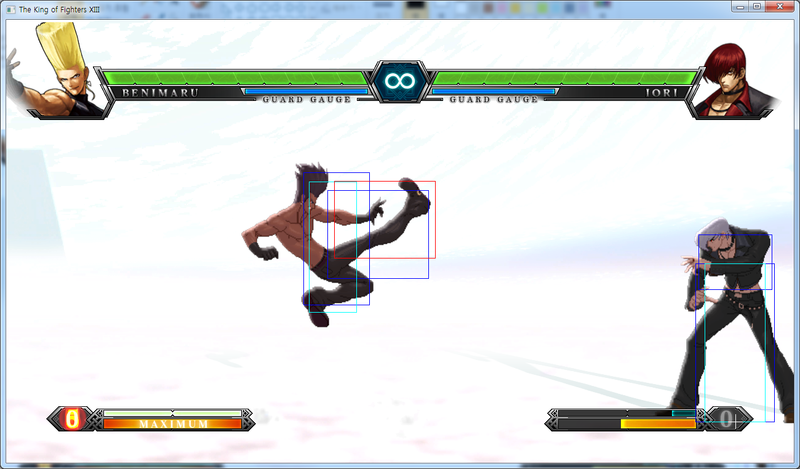 On block, you can punish the second kick with the Benimaru Collider (hcb,f+P or hcb,f+AC). You will have to GCAB roll the first hit of his df+D during his cr.B, cr.A, df+D block string. Benimaru does not have anything to reach him in time during his recovery from the second hit of the df+D during that string. If someone is trying to spam Kyo's hop or hyper hop j.2C against you on block, simply dp+D them to score a counter hit. Punish Leona's b~f+D with Benimaru's hcb,f+P command throw. This page was last edited on 15 December 2014, at 19:39.